This aeroplane below is one manufactured by Luft Verkehrs Gesellschaft mbH. Cleverly or thankfully, the makers were known as LVG – and this one is a CIV. This was actually the first German heavier-than-air machine to drop bombs on London. The crew were lucky to get back home over the Channel as it developed engine trouble. No great surprise for them probably as this was one of the few machines to use the Mercedes DIV engine. Mercedes produced some of the best and most reliable six-cylinder aero engines of the Great War, however this was a straight eight and on the limit of reliability due to its mighty crankshaft length and the subsequent stresses on it. Mercedes went back to their sixes after this effort. There was also some doubt about the structural integrity of LVG’s airframe itself. Not TOO confidence inspiring I would think. That’s the huge exhaust-system alongside the crew too. It must have been deafening. 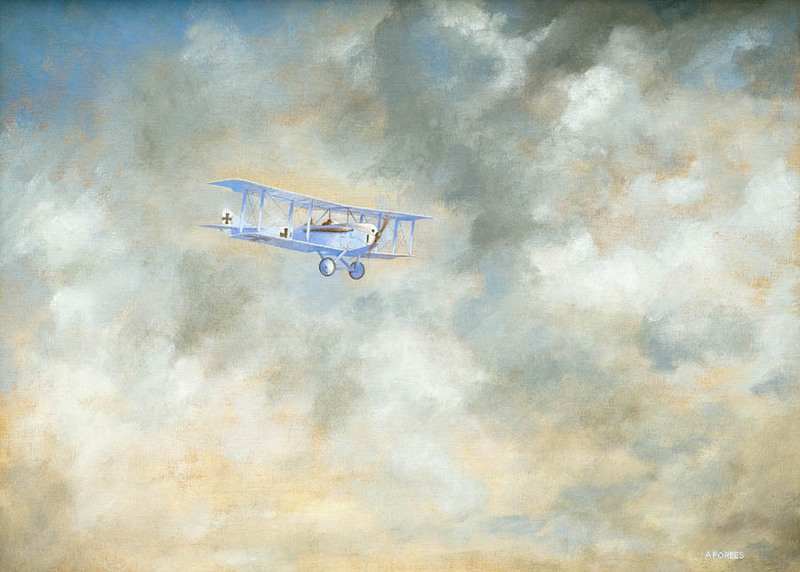 My thanks to John Constable too – whose clouds I shamelessly tried to emulate in this oil. This Post was posted in Aero Painting, History and tagged LVG. Bookmark the permalink.